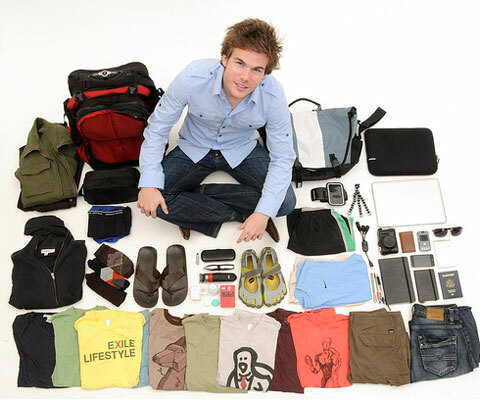 Meet Colin Wright… World Traveler, Minimalist and Entrepreneur! If you can define yourself in few words, what would they be? Ambitious in my pursuit of a NEW American Dream. Why did you decide to pursue this dream of yours and what was the triggering factor? I decided to pick up shop and convert my studio into a traveling operation when I realised that I was working 120 hour weeks and barely seeing my girlfriend (that I live with!). I was making a whole lot of money, and when I had the opportunity to step back and take a look at things from a higher vantage point (in this case, Seattle), it became glaringly apparent that I was going to reach my goal of making my first million in my mid-20’s, but I was not going to be able to spend it. My ‘work hard, play hard’ mentality had shifted into overdrive, and I was running on adrenaline and getting sucked into the game. I decided the only way I would be able to pry myself from this path was to do something drastic and different, and to change my definition of ‘success’ in the meantime. How your friends and family reacted when you told them about your project? With equal parts amazement and horror, I think. I’m actually incredibly fortunate to have the most supportive family anyone could ask for. My parents and siblings have been with me 100% with all of my harebrained schemes and tangents throughout the years, but they also know that I’ve failed enough to understand the consequences of my actions and to be able to pick myself back up when things hit rock bottom. My friends have been equally awesome throughout the entire process. Many of them I was leaving behind to travel, but we stay in touch online, and they continue to be just as supportive (if not more so) of me and what I do as before. I’m really incredibly fortunate to be surrounded by such amazing individuals. What is the best part in this amazing adventure? I love the thrill of constant change. This is something I was missing in LA – I had a challenge and a large degree of success, but I didn’t have the opportunity to try out as many new things as I would have liked, and it’s difficult to experiment with your lifestyle when you’re in the same place, around the same people all the time. Every 4 months I have the opportunity to, more or less, start over from scratch. I can be whomever I want to be, do whatever I want to do, and apply all the lessons I’ve learned without comfortable habits and the expectations of others holding me back. Meeting so many new people and learning about their outlooks on life has been amazing, as well. I’m absolutely fascinated by sociology and culture, and being able to add so many different viewpoints to my stockpile has been incredibly valuable philosophically. How do you support yourself financially? I run a branding studio and a few online endeavours. Exile Lifestyle is a vehicle for selling t-shirts and ebooks, and ebookling is taking my e-publishing habits even further. I’m hoping to bring in some affiliate money through my new travel product and service review site, Flashpack. I also take on the odd writing gig and there’s a great travel site that I write for regularly. What is your favourite country so far and why? Ah, that’s tough, because they’ve all been awesome for some reason or another. I would say from a pure livability standpoint, New Zealand was perfect. Everything (except their Internet infrastructure, but don’t get me started on that) was beautiful and friendly and idyllic, to an extreme. On the other hand, Buenos Aires was more of an adventure, quite a bit cheaper and it was my first experience living outside of the US, so I can’t help but still feel like it’s kind of my overseas home. Thailand is shaping up to be a great place to live, but it is definitely a two-way street; the poverty here is a lot more evident than even in Argentina. Do you speak other languages than English? Did you learn any while traveling? I speak passible Spanish, but I’m nowhere near fluent. When I travel, I do what I can to pick up the languages, but I try to do it naturally, through conversation with others. Truth be told, a lot of what I’ve learned has been on dates, since that’s one of the few situations where you can sit one-on-one with someone and speak for a great length of time and both have a vested interest in figuring out what the other person is saying! Who are the persons who influenced your choices in life? Who do you admire? My parents, of course, first and foremost. There’s been so many authors and philosophers and entrepreneurs that I’ve come across that I’ve taken something from, but really nobody stands out as the PERFECT guru or influencer, if that makes sense. I disagree with enough tenets of each people I respect that I would say they’ve helped me clarify my own beliefs, rather than giving me theirs. 5 tips you could give to people who want to have your lifestyle? 1. I know it’s crass in certain company to talk about money, but this is something you must always be thinking about. If you can’t afford to eat, you can’t afford to do what you want, when you want. Get the money issue settled first, then life is like recess. Forever. 2. Be open to everything. New ideas, new languages, new styles, new philosophies, new sports, new world views. Be like a sponge for it all, but don’t just accepted it as fact; filter. This is a lot like what has made Google so successful: they take in EVERYTHING, and then filter away the unimportant so that the really good stuff rises to the top. Be like that in life and you’ll get a lot more out of it. 3. Give give give. If you are constantly giving value and helping others and doing what you can to make life easier on as many people as possible, then you will be much more likely to succeed because everyone else will be cheering for (and helping) you. 4. Be confident, but make sure it’s a confidence that comes from knowing how little you know. The best scenario is being able to tackle any problem head-on because you know that, regardless of whether or not you’re able to solve it, you will be able to learn and EVENTUALLY figure out how to solve it. This is the kind of confidence that comes from a whole lot of failure, not from perpetual success. 5. Streamline your life and identify what’s truly important to you. If you haven’t yet done this, you’re likely aiming for a goal that isn’t yours, it’s just what everyone else and the media have told you is the prize. This is why so many people achieve so much and then are unhappy…they were running incredibly fast in the wrong direction. I would love to bring massive change to the American education system, help bring about a revolution of sorts where more people are able to do what they want for a living, and continue to surround myself with people who inspire me. I’m headed in that direction, though, and honestly I feel like I’m exactly where I need to be, doing what I need to do. It’s a really good feeling. Thanks to Colin for his participation and this precious advice. Don’t hesitate to follow his adventures and vote for the next country he is going to visit….it can be yours! https://www.k-international.com/wp-content/uploads/2018/09/weblogo-V7l.png 0 0 Alison Kroulek https://www.k-international.com/wp-content/uploads/2018/09/weblogo-V7l.png Alison Kroulek2010-09-24 09:17:582013-10-15 14:16:56Meet Colin Wright... World Traveler, Minimalist and Entrepreneur! Great guy seriously. I read a lot of his stuffs and posts, it’s truly wise and make you see things on a different level.